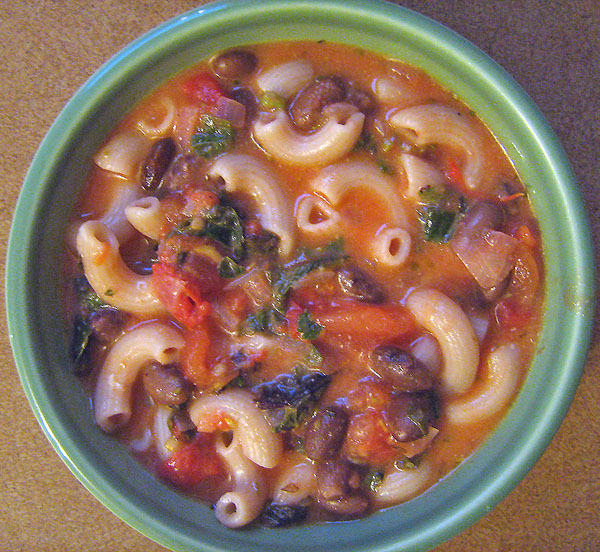 Pasta e Fagioli is peasant food – or what my Italian grandmother simply calls “pasta and beans.” I made this version with onions, chard, fresh parsley & basil, elbow macaroni, pink beans, and cheese. I prefer a nice sharp pecorino Romano cheese, but any Italian type grating cheese will work and even cheddar will do in a pinch. Cook the macaroni. Saute the onion & chard in EVOO til soft. Add the chopped tomatoes and granulated garlic. Let it come to a bubble, then add herbs, cheese and cooked pasta. Season with salt and pepper. Cook until the ingredients heat through and meld into a saucy, delicious dish! Cost: About $2.10 per serving with gluten free pasta (I use Tinkyada rice pasta) or $1.75 with conventional pasta. 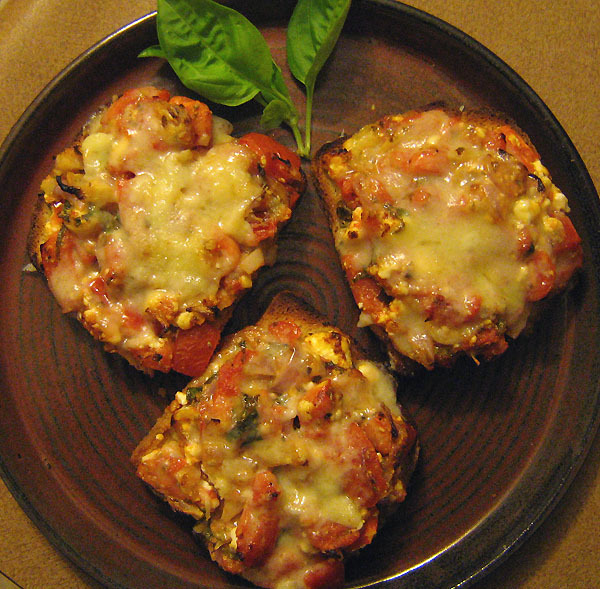 Gluten-free Pizzaschetta, Five Minute Foodie Style! Today I worked the last outdoor farmers market of the season. For those who don’t know, I work for a local organic vegetable grower, selling his vegetables at a local market. It’s a nice change of pace for this city girl and it supplies most of the fresh local veggies you see me cooking with here. The farmers market is such a wonderful little community, and there’s generally no place I’d rather be. But today it was COLD (in the low 40s) and DAMP! As much as I love Upstate New York, I have to admit the weather sometimes tests our relationship. To add insult to injury, the market manager bought us all pizza from the best pizzeria in town. It smelled delicious, but this wheat and gluten avoidant girl stayed strong. I’m not a confirmed celiac, but I’m definitely cereal grain sensitive. I gave up wheat 3 years ago and have been avoiding other sources of gluten for about 4 months. I can handle either on occasion, in small doses, but I have to be very careful. If I surpass my sensitivity threshold, my body starts to ache, aggravating my fibromyalgia symptoms. Or I get a headache or the sniffles. So, most of the time I just don’t tempt fate. But, boy, did that pizza smell good! So, I came home and whipped my own gluten free version. After all, pizza is mainly bread, tomatoes, cheese and a few seasonings. I had gluten free bread, tomatoes and cheese – so, what’s wrong with taking a few liberties to satisfy a craving? I named it such because it has the flavors of pizza, but is assembled like bruschetta (then baked). Now, doesn’t that sound yummy? Lightly toast your bread slices. Dice the tomato and put it in a mesh colander or sieve and press lightly to extract the excess juice. Mix tomato with the chopped onion or shallot, the herbs and olive oil. If using feta, crumble a little and add to the tomato mixture. 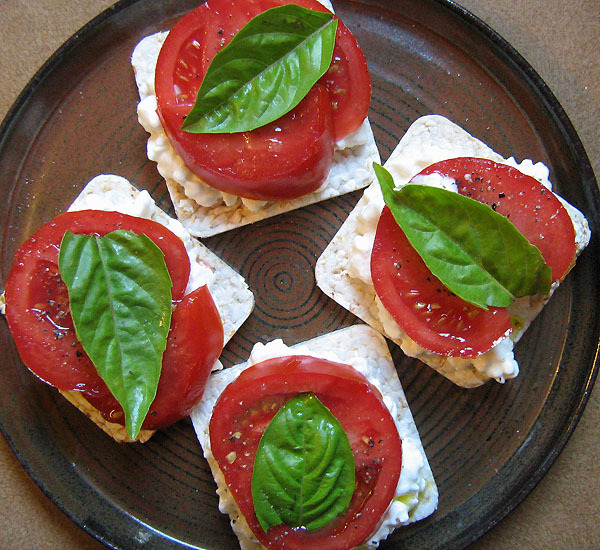 Lay out the toast on a cookie sheet or foil and pile your tomato mixture on top. Broil about 10 minutes on the lowest shelf; you want to warm the tomatoes through & perhaps get a tiny bit of bubbling or browning on top. Your ktichen will fill with a lovely roasted tomato smell. Top the slices with whatever cheese you choose – it’s nice to have a good melting cheese in the mix, which is why I chose a combo of cheddar and Romano. Move the broiler shelf up; it should take just a few more minutes to melt the cheese on top. I like it a little bubbly. The bread got a bit soggy from the fresh tomatoes, but the crust was crispy. I may swab the cooky sheet with a bit of olive oil first next time, because there was a tiny bit of sticking. I was quite happy with the delicious result, though! 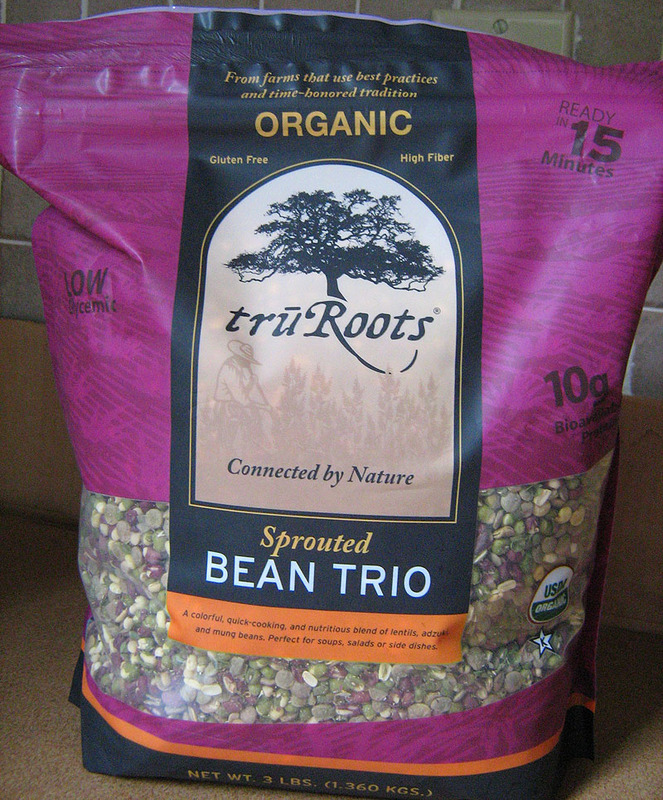 My sister sent me a bag of Tru Roots “Sprouted Bean Trio” that I was excited to try after her rave reviews. She says she gets it in 3 lb bags at Costco for less than $10. The Sprouted Bean Trio is a quick-cooking mixture of sprouted lentil, adzuki and mung beans. 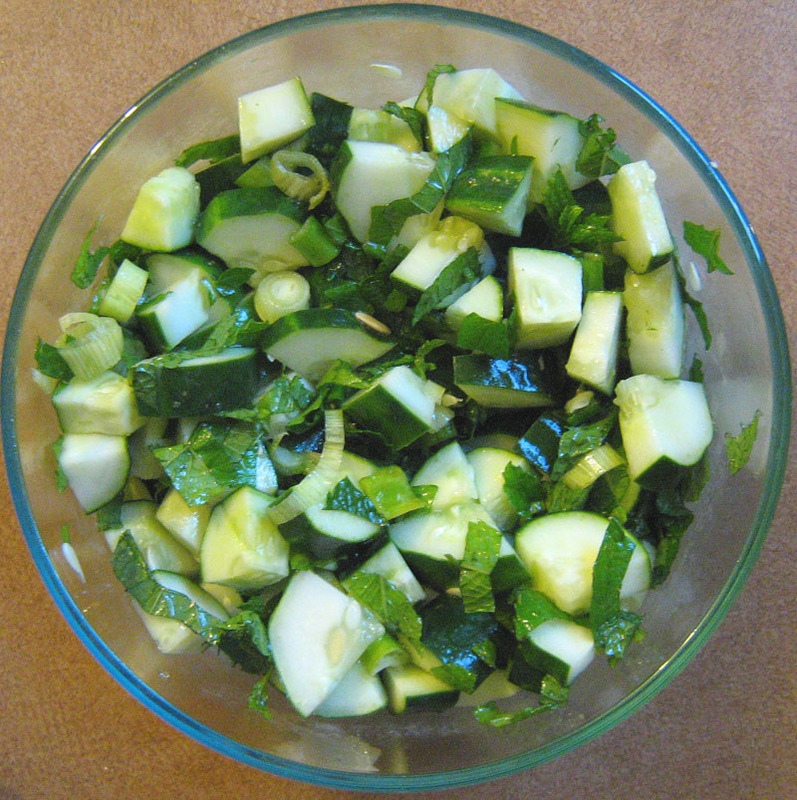 I’m a big fan of ready-to-eat cold dishes, so I made a basic salad, along the lines of tabouli. The result was delicious, with the sprouted beans having a nice light texture. One cooked cup has 11g protein and a whopping 11g fiber. The package claims that the sprouted beans “boosts the nutritional profile” and makes them more digestible. I cooked 1 cup of the mixture in 3 cups of water, as instructed, but had to drain some off. I ended up with perhaps 3-1/2 cups of cooked product. The millet cooked up to about 3 cups. This recipe made close to 8 cups; that was enough for about 5 generous servings that I augmented with some additional vegetables and/or protein to make a meal. It would go further as a side dish. Any grain would work here; I used millet because I was following one of my Five Minute Foodie organizing tips: use what you have. Cook the Sprouted Bean Trio and Millet according to directions. Combine bean, grain and vegetable ingredients. Whisk olive oil, lemon and salt together and toss. 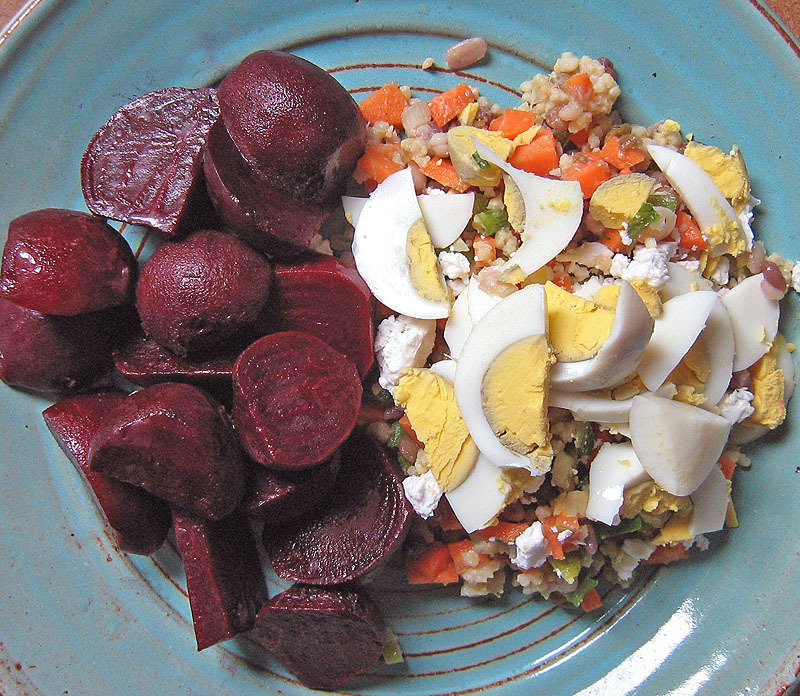 Enjoy this yummy salad on its own or with additions of crumbled feta or goat cheese, chopped egg or sliced veggies. Dietary notes: a healthy dose of protein and fiber; ♥ Vegan. Sub quinoa for the millet to make it ♥ Gluten Free. Cost: less than $4 for the batch, or $ .50 – $1 per serving, depending on how much you use. And that’s with organic ingredients!